Welcome to the Rose Blossom Blog Hop! We are featuring the beautiful paper, Sangria, and all that goes with it. You are going to love this circle hop. No matter where you start, you can just keep on going around till you get back to where you started! This is one of our kraft containers. I love using them for all kinds of things. What a pretty container to give as a gift or to keep for yourself! 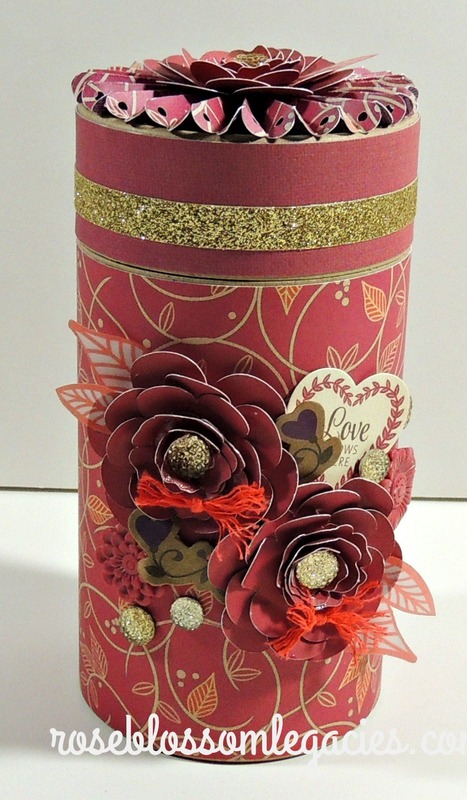 I've used a lot of fun embellishments including the Sangria complements and assortment. If you like this container, come back tomorrow when I tell you about my November Creativity Workshop. This kraft container is a part of it, so you can have this in your home!! But for now, I want you to head over to Lynn's blog to see what she has waiting for you. I know it's going to be wonderful!! Thanks for stopping in today! We appreciate you visiting the Rose Blossom Blog Hop!! Gorgeous! I love your containers. The flowers are just beautiful!!! This is stunning. I love the gold accents. Just gorgeous, Brenda! Beleive it or not, I haven't yet decorated one of these containers, but it is definitely on my list. You are always such an inspiration! Another lovely floral creation. I was inspired by your Sangria Operations Smile piece when I created by display tray. I thought of you the whole time I was making those rolled flowers. This is gorgeous!!! I haven't tried these containers yet. Gorgeous Brenda! Love all the little touches you added to make this beautiful container. This paper is so stunning in this project!!! I'm in awe!!! This is just over the top gorgeous, my friend. Very "Brenda"!